On the way from Abiko to our new host families in Tama, we made a stop at the National Diet building. This is the place where the people’s political representatives gather. 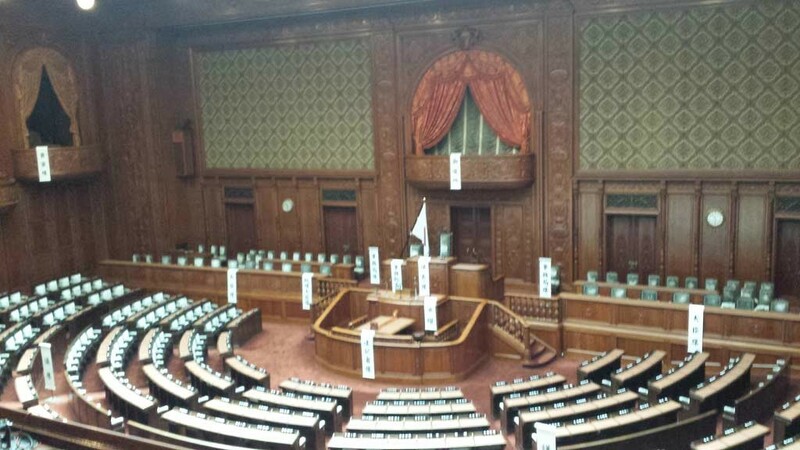 It is similar to a parlament in Europe. After a guided tour through the building, including the emperor’s chambers and the main meeting room, we had a chance to actually meet one of the people’s representatives. He was Mr. Kado from the Liberal Democratic Party. We asked several questions. One of them was concerning his solution for the growing urbanization. Because young people go to the big cities, it leaves the elderly out in the countryside, with no one left to take care of them. We were also curious about the coming summer olympics in Tokyo. More specifically, the games will bring a lot of foreigners to the country. At this point in time, the Japanese language skill and cultural understanding might not be sufficient to adequately host so many foreigners. So, we asked Mr. Kado how he thinks this problem will be solved. could help the Japanese shed the idea of a secluded society (one that still lingers since the end of the Edo era). Personally, I would have liked to hear some attempt to make the Japanese interested in going abroad themselves, instead of counting on the people of other nations to come to Japan. Nevertheless, it was interesting to hear his opinion. Previous PostWCJ 2015, Session 3: Abiko City Slide ShowNext PostLunchboxes and driving school!